This part describes functions available on the customer list page. 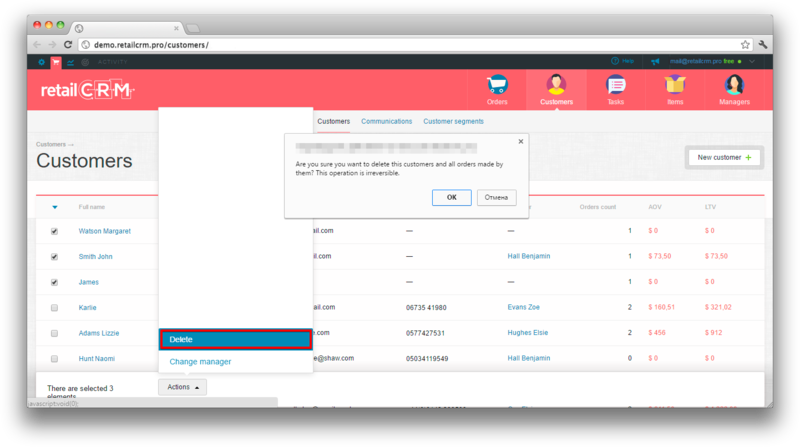 Filter by customers contains a number of default fields. If user adds other fields, such filter will be available only in his account. Each user can configure the filter individually. Filter field configuration setup is similar to order filter configuration. Look through Filter content configuration subsection. Table columns configuration setup is similar to the columns configuration setup in order filter. Look through Table columns configuration subsection. It is possible to display a table column with notes of a customer in the customer list. For this you should open a window with configuration of the table columns and select “Notes”. 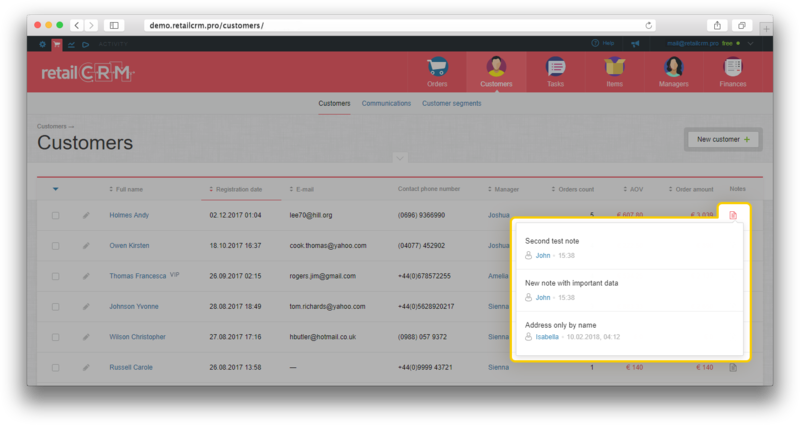 If the customer has already created notes, an icon will be displayed in the corresponding table column. When clicking the icon, a pop-up window with notes and their number will be open. If you click the link “View all”, you will find yourself on the tab of the customer page with previously created notes. Sorting and pagination of customer list page is the same as the one of order list page. Look through Sorting and paginationsubsection. The functionality of data export to table on the customer list page is similar to one on order list page. Look through Data export subsection. It is also possible to import customers to the system with the help of our service XLS2CRM. 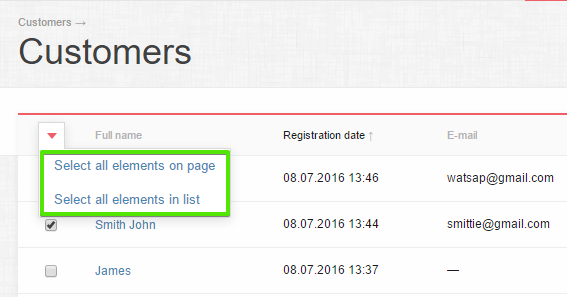 It is possible for the customer list to highlight several or all customers with a tick and make a group action. 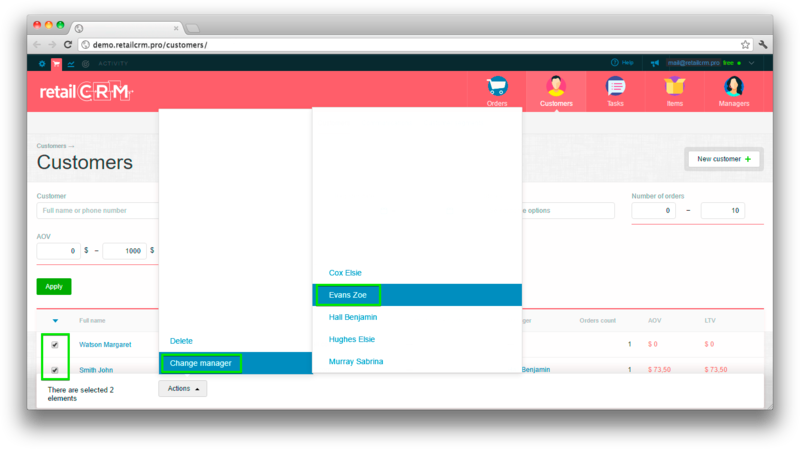 For example it is possible to massively change manager to the highlighted customers. To select all customers on page or from list, press arrow down. It is also possible to select a definite area of customers holding "Shift" button. For example, you need to select first ten customers. You set a checkbox near the first customer, then hold "Shift" and set the checkbox near the tenth. There is also a possibility to delete several customers at once. After selecting customers “Actions” button appears. Pressing it we see the list of possible actions. You need to choose "Delete" in it. The system will show a warning - Are you sure you want to delete these customers and all orders made by them? This operation is irreversible. Note: for a single time the system can delete 100 customers maximum..
Also the corresponding rights in “User group” settings should be enabled for customer deletion. This action deletes all files in the selected customers. 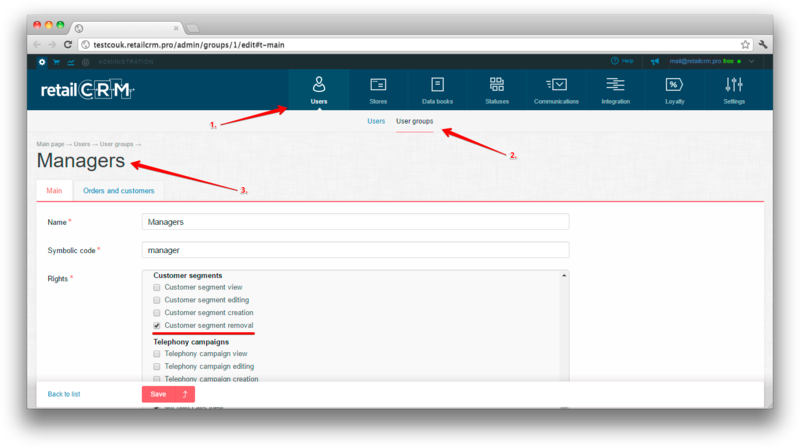 Allows you to change the value of a custom field for several customers at the same time. You can find more details in the section "Custom fields". This action changes the responsible manager.